You want to know something great about slow cooking? It’s awesome for practically everyone! If you live in a tiny house, it’s great because you don’t even need a stove! If you live in a big house you have plenty of counter space to set up an army of slow cookers if you like. Likewise, if you have a small budget, you can still get a great slow cooker that will cook a perfect dinner. If you have a bigger budget, you can get one with more features and possibly one that multi-tasks. There are even some slow cookers you can control with your smart phone! 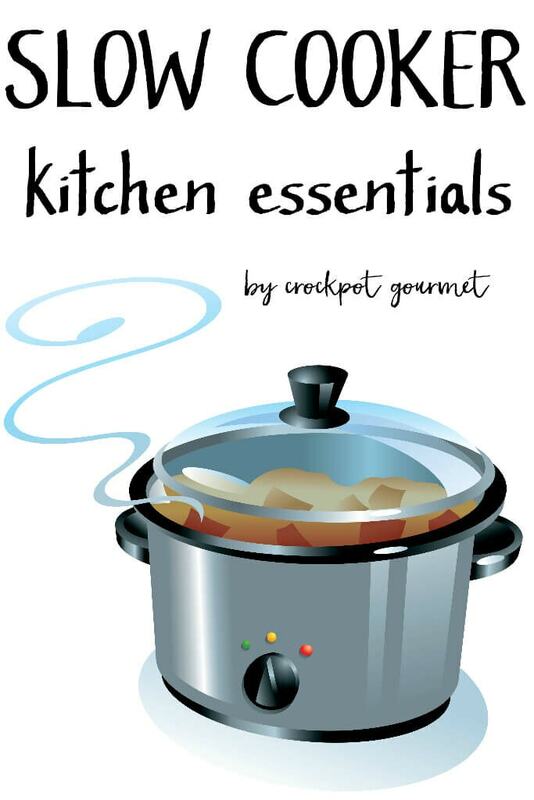 So, whether you are new to slow cooking or looking to up your game, I thought it would be fun today to talk about the essential items needed to create a “slow cooker kitchen”. Everything from the basics all the way up to to fanciest gadgets with all the bells and whistles, there are set-ups that will fit for just about everyone. You don’t have to invest a lot to have a great set up and I often use one of my most basic slow cookers that was less than $20 for many of my recipes. That being said, some of the feature-rich slow cookers are pretty nice too, and I use my multi-cooker pretty much on a daily basis. What items do you need for your slow cooker kitchen? Let’s take a look!! The first thing to consider is how many people you will be feeding. For one or two people you will want a 2-3 quart slow cooker, for 3-4 people you will want a 4-5 quart slow cooker, and for 5 or more you will end up in the 6-8 quart range. The second thing to think about is whether or not you will be home while your food is cooking. If not, you will want to get a slow cooker that is programmable and will switch to warm at the end of your set cooking time. This will save you much frustration over burnt meals not to mention stress if you are running late. Like I said, there are even options now that will let you control the slow cooker via your phone! Finally, what kind of features do you want? Basic slow cooking? The ability to brown and slow cook in the same pan? Something that steams or cooks rice or grills too? Do you want a device that can do it all or do you like to have dedicated devices for each of these functions? What slow cookers do I recommend? That’s tough, because there are so many out there and even though I have a collection of about 10 I’m nowhere close to having personally tried them all. (A side note, having like 10 slow cookers makes no sense when you are (me!) trying to pare down your stuff and be intentionally more minimal about the clutter, but I guess that’s a challenge for another day). Once you’ve narrowed down your parameters based on the above list, it will be easier to search on Amazon or wherever you like to shop, and you can always read reviews of the models you are considering. That being said, I will tell you about the slow cookers I use and why I love them! – This actually comes in a 6 and 7 quart model as well. The reason I chose the 4-quart was that I typically cook for 4 people and this is the perfect size. I chose this particular slow cooker, however, because of it’s features. I love that I can brown my meats or sauté some veggies without having to dirty up an extra pan. When I bought it I wondered how much I would really use this feature, but I can tell you I use it all the time and I love it. I also love that the “crock” is actually a non-stick material and it’s SUPER easy to clean. For these reasons, this slow cooker is used almost daily at my house. Have a larger family to feed? Chose the 6 or 7 quart model. Only have a couple people to feed? Eat half the meal and freeze the other half. I’m going to talk about freezing food in detail later this week. 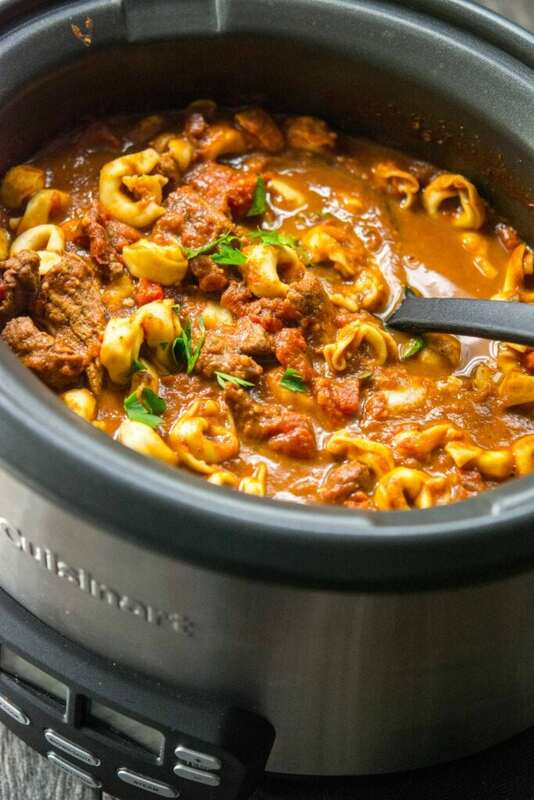 – This slow cooker was very inexpensive, yet it does an amazing job of cooking the food! It cooks evenly and consistently and is the perfect size for a large roast or a batch of chili. I use this one a lot on days when I’m going to be home since it is manual, but it does have a keep warm setting which is especially handy for letting those soups just simmer while you have company. – this is a great option if you need a smaller programmable slow cooker. I used mine for years and it never let me down! I was super sad when I lost it in a slow cooker crock vs. granite composite sink battle and almost replaced it, but ultimately decided to go with a multi-cooker at that time. – this is so perfect for dips or when I’m just making up a couple of chicken breasts to shred up. Also great if you are just cooking for one or two people, you can cut many recipes in half and make them in here, which I do from time to time when I just want to test things out. You will also need a few basics kitchen tools in order to prep and finish your meals. There are obviously a gazillion more kitchen gadgets out there, but since today I want to focus on the essentials, I’m just going to show you what I consider to be the basic must haves. – this is probably my most used kitchen utensil. Use it to flip meat, to stir veggies, basically everything! because they don’t slide around on my granite counters and you can just pop them in the dishwasher. to shred your own cheese quickly. I’ve had this exact one for many years and it’s still going strong! many times throughout the day. They cut meat, they cut herbs, they help you open packages (your aren’t supposed to use them for this!). Mine have taken beating to say the least. to hold my plastic bags. No more food dumped on the counter as these are pretty sturdy and get the job done. I could go on but this is a lot of information for one day! I’m working up a separate post to talk about what spices and pantry items to keep on hand so that you have the basics of what you need to make most any meal! What else do you want to know? So, what do you think? Any other essentials you would like to recommend? What would you rather not live without? Slow Cooker Gourmet is a participant in the Amazon Services LLC Associates Program, an affiliate advertising program designed to provide a means for sites to earn advertising fees by advertising and linking to amazon.com. If you purchase a product through this link I will earn a small commission. As always, I only recommend products I use and love! I think, so far I like the ‘idea’ of a slow cooker more than I actually like the results from my slow cooker(s). I have 3 – small, medium and large. What I can’t seem to do is to end up with meat that doesn’t taste boiled. Even on low my slow cookers seem to boil everything rather than simmer. And the food tastes like boiled dinners. Do I use too much water? How little can I use? Hi Miriam! Let’s change that for you!! Nobody wants a boiled meat taste! The first thing to keep in mind is that your slow cooker ideally should be about 2/3 full. Since you have several sizes you should be able to pick the one that works for your recipe. The other thing I’ve learned is you don’t necessarily need to add much liquid when cooking meat. And I never add water, if anything it’s usually broth. Maybe try this roast beef recipe? Tastes like it’s been roasted in the oven, but juicier! Or if you like chicken, here is one that cooks in broth that then gets turned into a delicious sauce! Browning the meat first can help, but isn’t mandatory. Let me know what else I can do to help! Thank you so much Jennifer – I will definitely give either or both of these a try and I’ll let you know how I make out. I am travelling right now – actually in India visiting my son who is on an overseas assignment – and will spend another 3 weeks in China before heading back to North America (I live in Canada). I’ve been away for 3 months now and am actually having longings to be in my own kitchen (but don’t mind missing the snow at home – here is a balmy 80 degrees. I’ve learned a lot about cooking Indian food here that I plan to carry back with me to the kitchen. And I think a slow cooker is the perfect appliance for Indian food although here they use Pressure Cookers more (again – I hate that boiled taste but with enough spices it seems to work. I’ll be converting recipes to the slow cooker. Miriam, that sounds amazing!! I would love to spend some time learning Indian cooking, what a wonderful opportunity!! Keep me posted on what you make in your slow cooker 🙂 And China! I’ve been twice and spent two weeks each time. I miss it so much! What an amazing country and a wonderful experience. I hope you enjoy your time there.